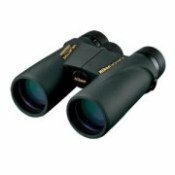 This page offers Red-tailed hawk identification characteristics when viewing both adults and juveniles in the field. Many people can recognize a "Red-tail" when they see the bird's red tail. 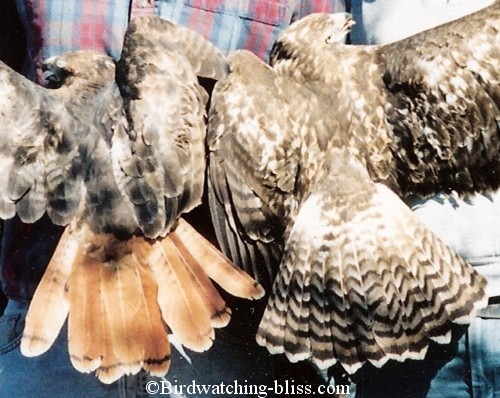 But juvenile Red-tailed Hawks do not have red tails until they are about one year old (comparison of adult vs juvenile tail in photo above). Sometimes the red can not easily be seen on the tails of even the adult red-tails because of the bird's position or the light conditions. So how can we identify a Red-tailed Hawk if we can't see the tail? Click on the photo of the flying juvenile (immature) Red-tail Hawk to the left to see the characteristics that identify this bird (picture is of Eastern Race). 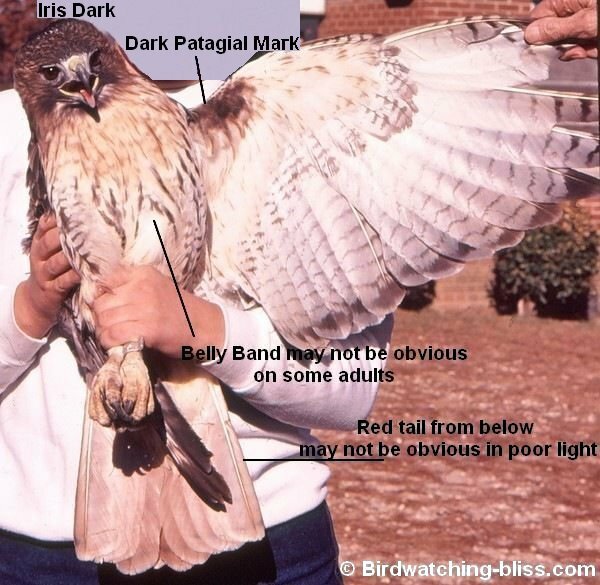 Dark Patagial Mark - this mark should be visible on all light phase Red-tailed Hawks of all sub-species. Look for this field character first. 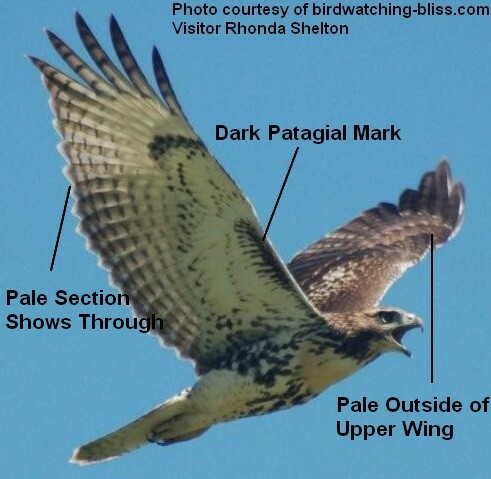 Since most Red-tails in the East and a majority of Red-tails in the West are light phased birds, this character can be used to identify most Red-tailed Hawks. Pale panel on outside of upper side of wing - This pale mark is on the primary feathers and the primary coverts. 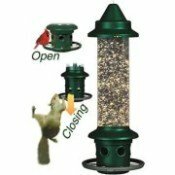 It can also be seen from the underside if light is shining through from above. 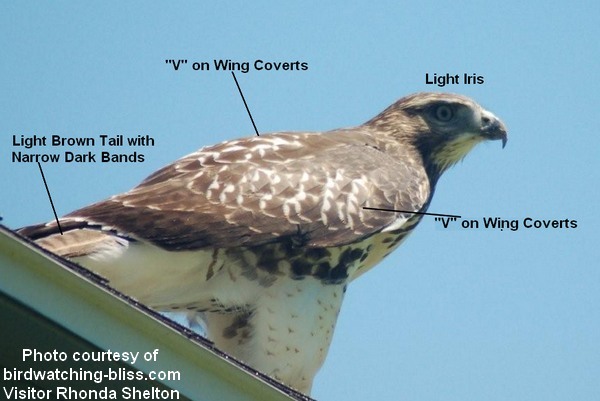 According to Wheeler and Clark in A Photographic Guide to North American Raptors , this is the best character to identify all juvenile Red-tailed Hawks. Click on the photo of the perched juvenile Red-tail Hawk to the left to see the characteristics that identify this bird from behind. light colored edges of the scapulars and upper coverts form a v-shape on the back. Pale panel on outside of upper side of wing - This pale mark is on the primary feathers and the primary coverts. 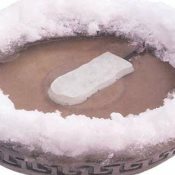 It can also be seen from the underside if light is shining through from above. Notice that the tail is light brown (not red), with narrow bands. Also notice, that the eye (iris) is light (compare to adult below). Click on the photo of the hand-held adult Red-tail Hawk to the left to see the characteristics that identify this bird from below. Dark Patagial Mark - as with the juvenile picture above, this mark should be visible on all light phase Red-tailed Hawks of all sub-species. Remember to Look for this field character first. This particular bird also has a faint belly band. This character is not obvious on all adults. Also notice that the red tail can be seen through the tail from below.